National Grammar Day is just around the corner—it's this coming Monday. And to celebrate this mighty day, we're having a sale! The sale starts this Friday, March 1st, and goes through all of Monday, March 4th. Everything in our TpT Super Grammar Store will be 20% off. Our Teachers Pay Teachers store is where Parents and teachers can go to get Super Grammar goods as a digital download (in PDF format) to use in their homes and in their classrooms. 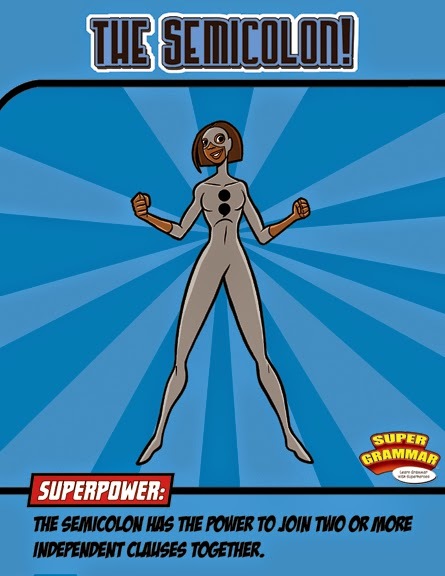 Learn grammar with superheroes from our textbook: Super Grammar. 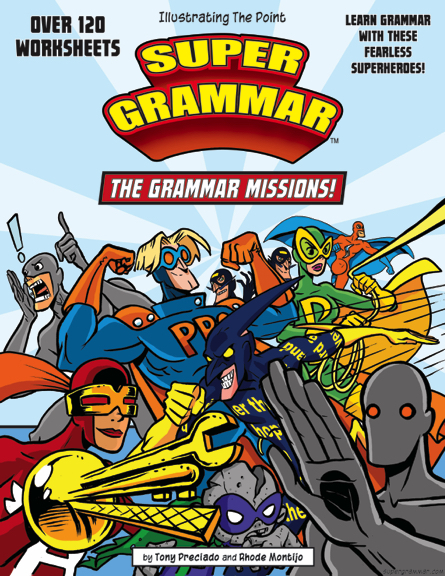 Practice grammar with superheroes in our workbook: The Grammar Missions! And for extra saving, be sure to check out the Super Grammar Power Bundle—which includes Super Grammar, The Grammar Missions, and the Super Grammar Mini-Posters—all of them bundled at a special price. To all of our superhero-loving friends out there who believe that their sentences are worth fighting for, we're proud to stand with you. 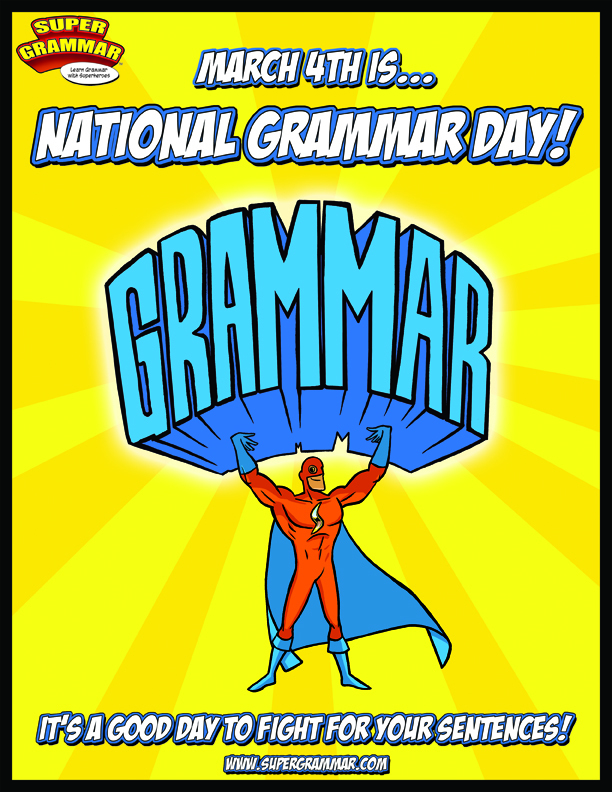 Have a great National Grammar Day, and may your sentences always be strong! When I was a kid, I had a rough time with grammar. Believe it or not; it didn't greatly interest me. Yup, no kidding. Grammar didn't interest me much at all. In fact, you might actually say that I didn't like learning grammar. And if you really pressed me on it; if you really wanted to know how I felt at the time—then I probably would have said something like this: "I hate grammar." Of course, there was more to it than that. After all, I was just a kid. I didn't truly hate grammar. The real truth is, like any of my other classmates, I just wanted to be able to write good sentences. I really did! I was just feeling frustrated and confused because I was struggling with it. And when you're a kid and you get frustrated and confused by something, it's not long before you start saying that you hate it. How do I help this kid who is struggling with grammar? How do I help this young kid who is me, the one who is smart, the one who is curious, the one who secretly loves words (especially fantastic and unusual words, like uncanny, fortitude, and vertigo)? How do I help that kid who will some day grow up to be a writer, even though the very idea of it seems like a completely impossible dream? One fateful day, I told the tale of my childhood struggles with grammar to a good friend of mine. You'll never believe what he told me. He said that he had the very same frustrating experience with grammar as a kid. Our stories were practically identical in every way. It was uncanny. We felt compelled to continue our conversation, and the more we talked about it, the more we began to realize that maybe by working together—just maybe—we could actually do something to help. But what? We had to come up with a plan, so that's what we did. Create our own grammar book. Travel back in time to give ourselves this grammar book. It was a brilliant plan! We decided that we should move forward with it right away, so that's what we did. we wish we had when we were kids. After all, this grammar book was not for us; it was for our younger selves. It only made sense that we should make it with them in mind—so that's what we did. With our prime directive firmly in place to guide us, we were finally ready to start. It was a good feeling, and it gave us hope that, maybe with a little luck, it wouldn't be long before our grammar book started to take shape. As luck would have it, my friend and I both loved comic books and superheroes. We knew everything about our favorite superheroes. In fact, we had memorized every detail about them: their true names, code-names, secret identities, superpowers, strengths, weaknesses, hide-outs, home worlds, their allies, their enemies, arch-enemies, minor rivals, and (of course) their origin stories. Pretty much everything that revolved around superheroes and supervillains was interesting and inspiring to us. We loved their costumes and their various personalities. Their mysterious and amazing superpowers captured our imaginations, especially the odd-ball superpowers, like having the ability to smack someone with the force of a ton of bricks. And then... BLAM! 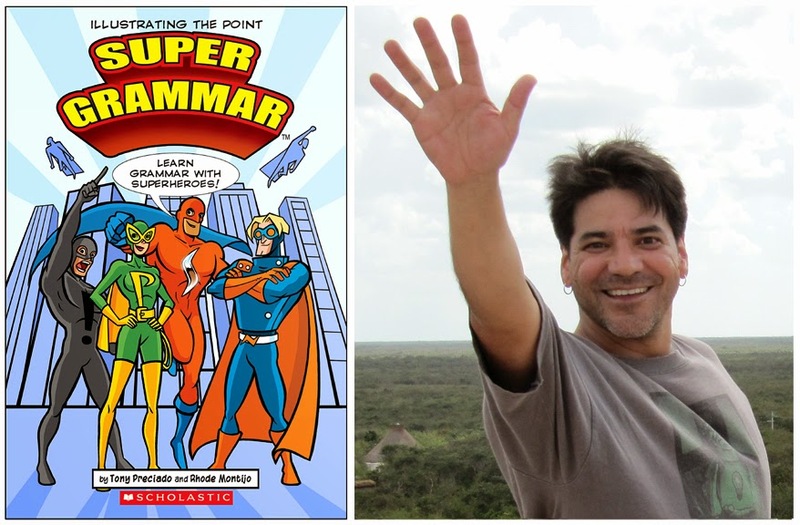 The idea hit me like a ton of bricks—what if we made a grammar book that teaches grammar with superheroes and supervillains? Without hesitation, my friend and I unanimously agreed that we should use a superhero-themed format for our grammar book, so that's what we did. We almost couldn't believe how well it was working. The elements of grammar became superheroes. The grammar mistakes became the supervillains. And with these two forces in place, we were able to set the stage for the classic superhero struggle—the never-ending battle between right and wrong! The artwork, graphics, and colors were comic-book inspired. Every explanation and example-sentence we used was related to superheroes or superpowers. Everything for our grammar book revolved around the superhero genre—everything. We had to wonder, was this our superpower? Whatever it was, all we truly knew was that we had to keep going until we finished, so that's what we did. My friend and I put in the time. We did the work that was needed of us. We never gave up. And then it finally happened; the inevitable day came when we had finished our grammar book. There was only one thing left to do for it. It needed a name. 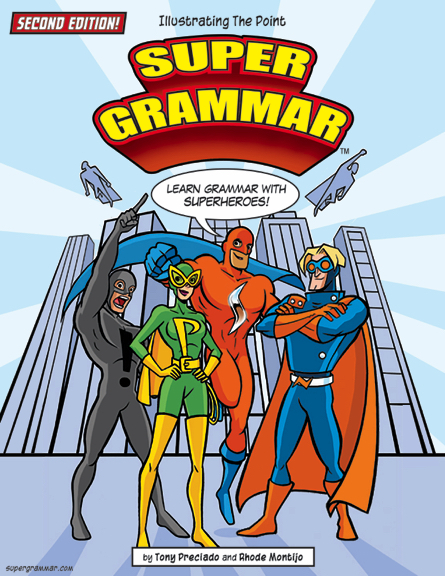 But what should we call our grammar book, the one that teaches grammar with superheroes and supervillains? My friend casually suggested that we simply call it Super Grammar. Super Grammar was the perfect name to give to our grammar book, so that's what we did. And just like that, we were ready for the second part of our plan: travel back in time and give Super Grammar to our younger selves. I wish I could explain all of the alternate timelines involved and the temporal paradox we created, and how we had to repair the very fabric of space and time so that everything in the universe didn't implode; but honestly, I'm not exactly sure that I fully understand it all myself. So instead, I'll just skip right to the good news—our plan worked! 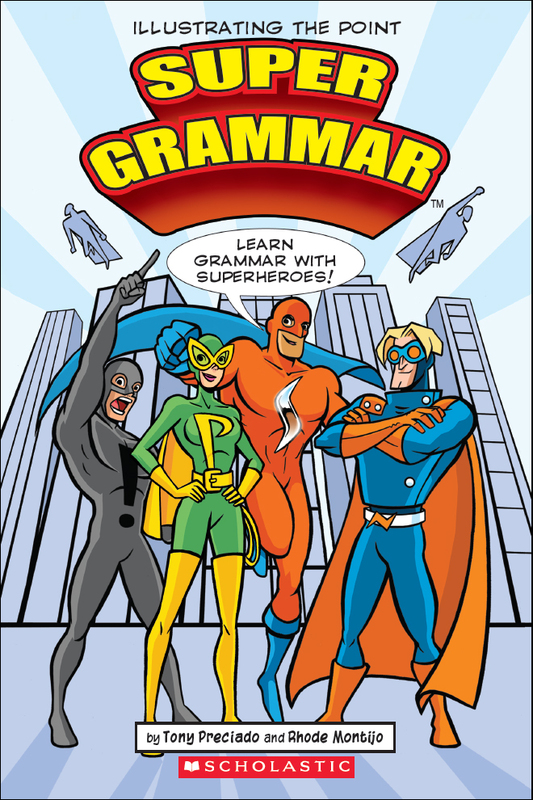 We delivered Super Grammar to our younger selves, and you know what... it was the grammar book we always wished we had. We had done it. We had helped those two kids to have an easier time with grammar. And in the end, that's what made it all worthwhile. And then... BLAM! It hit us like a ton of bricks! Maybe our work wasn't finished. Maybe—just maybe—we can use Super Grammar to help other kids who might be struggling with grammar right now. Maybe we can expand Super Grammar by adding a workbook. And maybe after that, we can keep building upon Super Grammar and make it accessible to the world. It was a brilliant plan, so that's what we did. Happy National Grammar Day, citizens! And to help you remember that it's a good day to fight for your sentences, we'd like to offer this print-it-yourself National Grammar Day poster from our download page! This poster (featuring the Subject) is available in two sizes: 8.5"x11" (small) and 17"x22" (large). You can pick the size that works best for you, or you can grab them both. Grab the FREE FILES HERE! 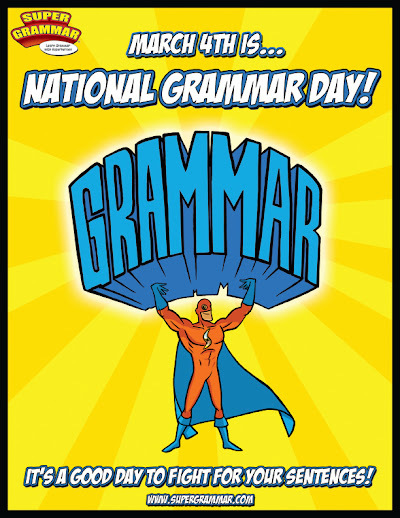 May your Grammar Day be full of fun, laughter, and superheroes. And may your sentences always be strong! I have some super news—I'm doing my first Super Grammar author event in Oregon. 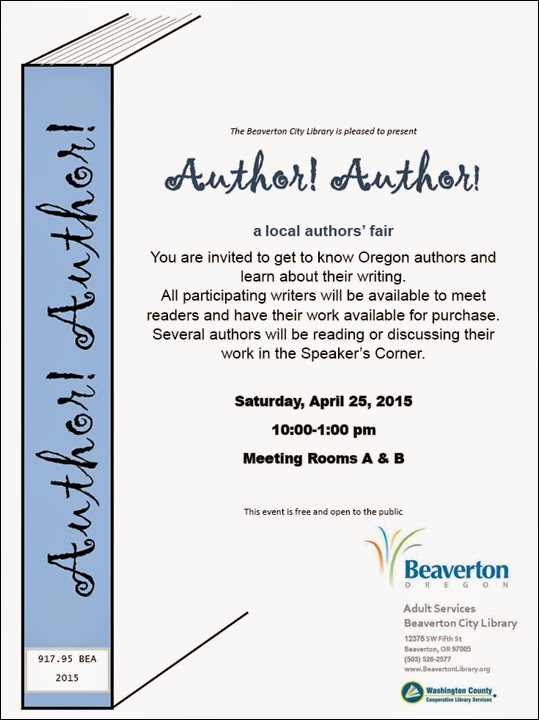 The Beaverton City Library is hosting a local authors fair, and I was invited to join in the fun. The event is on Saturday, April 25th, from 10a.m. to 1p.m. in Beaverton, Oregon (just outside of Portland). If you're a Super Grammar fan and you're in the area, please stop in to say hello. It's always a great pleasure for me to meet our fans, and I'll be happy to sign your Super Grammar book for you. Plus I'll have some Super Grammar goodies to give away, like bookmarks, stickers, and promo cards. 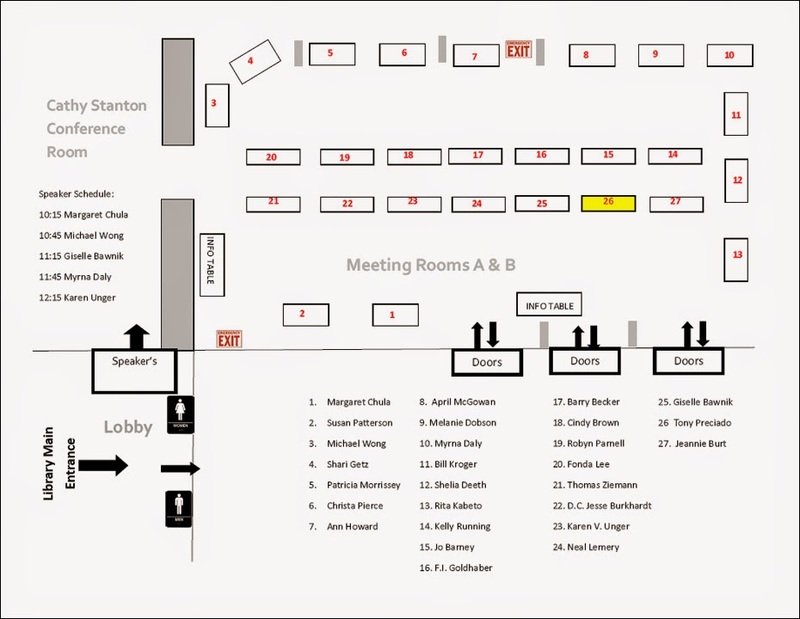 I'll be at table #26 in Meeting Rooms A & B of the Cathy Stanton Conference Room (highlighted in yellow below). Happy National Punctuation Day, citizens! 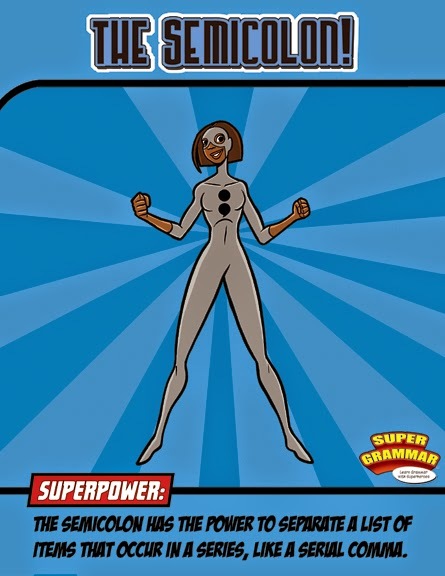 In honor of this mighty occasion, we thought it would be appropriate to shine the super spotlight on a very deserving Super Symbols team member and tell you about her second superpower. This deserving Super Symbol is none other than the elegant and powerful Semicolon. As most of you know, the Semicolon (;) has a first superpower. As this super handy mini-poster states, the Semicolon has the power to join two or more independent clauses together. This means that if you have two or more complete sentences that are closely related, you can use a semicolon to properly join them together into one sentence. Now, thanks to the power of the Semicolon, we have a single sentence with a unified message. And best of all, this sentence is correct. For a full explanation of the Semicolon's first superpower (complete with super examples! ), grab your trusty copy of Super Grammar and turn to the blue color-coded Super Symbols section of the book and review pages 136-138. And now, citizens, before we move on to the Semicolon's second power, I'd like to remind you that there is a wrong way of connecting two complete sentences—and here it is—never try to join two complete sentences with just a single comma. For example, if we try to join the same two complete sentences with just a single comma, like this, "Never give up, never surrender!" it would be incorrect. Commas, all by themselves, simply to do not have the power to join together two complete sentences. So watch out for this common punctuation mistake. Because if you ever do try to join two complete sentences with just a single comma, it means that you've fallen victim to a very tricky member of the Sabotage Squad called the Comma Splice. To learn more about the Comma Splice and her trickery, grab your faithful copy of Super Grammar and turn to the green color-coded Sabotage Squad section of the book and review pages 168-171. We caught these crooks: Mack, the brains; Stack, the muscle; and Slack, the flunky. The example sentence above is listing a series of three captured crooks (Mack, Stack, and Slack), and each crook has a short description which has been added on with a comma ("the brains," "the muscle," and "the flunky"). Since commas are already being used as a form of punctuation within the items being listed, it would be confusing if commas were also used as the form of punctuation to separate the items in the list. So instead of adding more commas (and confusion), the correct way to separate the items in this series is to use semicolons, because semicolons can act as an additional form of punctuation which can clearly and distinctly separate the items of this list. Excelsior! You now know the Semicolon's second superpower. And if you ever have a list of items in a series, and that list already includes commas, you'll know that you can use the power of the Semicolon to keep things super clear and super correct!